Want to ‘wow ‘your family with something sweet, beautiful and auspicious this Chinese New Year? 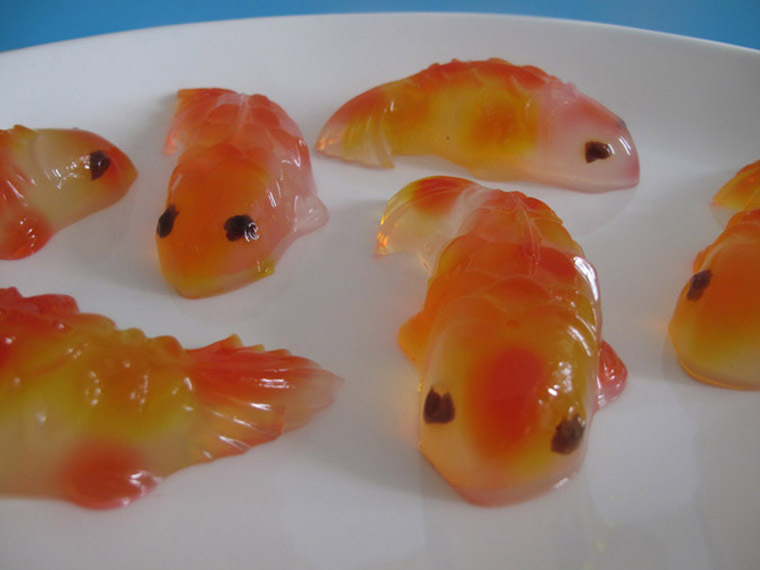 Try making Koi Fish Jelly! As the weather is normally extremely hot in Malaysia during this season, I assure you that this dessert will be more popular than the regular pineapple tarts or mandarin oranges. I absolutely enjoy making this jelly. Seeing how the fish come to life is so satisfying. It’s like magic! I’m not sure if the best part is seeing the wonder in the eyes of those who try it for the first time, or feeling like an accomplished artist who just sculpted something very beautiful. To make a jelly life-like, what we do is give it a little pattern and a pair of eyes. 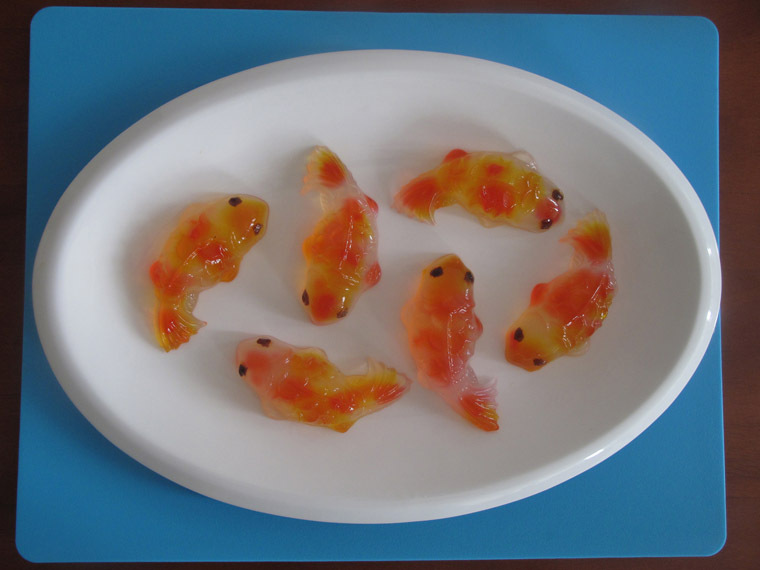 To create red and yellow patterns on the fish, we use yellow and red food dye. For the eyes, we use raisins. You will need a special tool (fish mould) and a few other things that are easily available at the neighbourhood bakery supplies shop. Step 2 Using your fingers, roll the raisins into balls. These are for the eyes. Step 3 Place water, pandan leaves, sugar and agar-agar powder into pot and bring to boil at low heat. Step 4 Stir throughout. Off the heat when agar-agar and sugar have completely melted. Step 5 Using a tweezer or chopstick, dip raisins into agar-agar liquid. Step 6 Stick the balls of raisin on the eyes of the fish mould. Step 7 Add a drop of colouring into a small bowl of agar-agar liquid. Step 8 With a teaspoon, smear the coloured agar-agar on fish mould body. Step 9 Gently pour in the rest of the jelly liquid into mould until it fills the brim. Let it cool before putting into the fridge. Step 10 Chill the jelly for 2 – 3 hours before removing the mould. You could also leave it overnight. 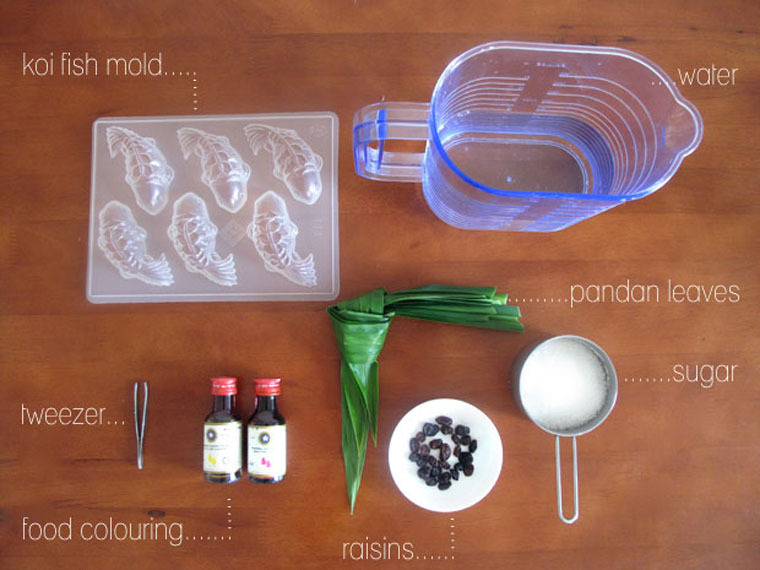 Boil 1L water + 2 pandan leaves + 3/4 cup sugar + 12 g agar powder. 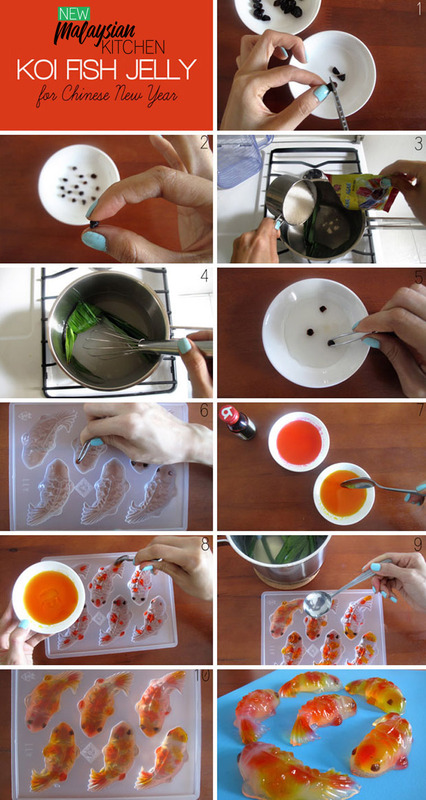 Dip raisins into jelly solution, then stick onto the eye part of the mould. Add a drop of red and yellow colouring into separate bowls with some jelly solution. 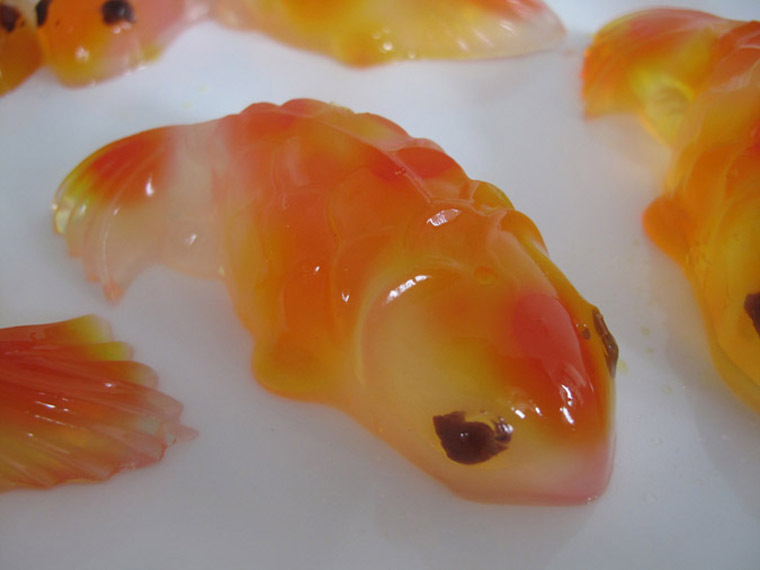 Smear red and yellow jelly solution onto the fish mould body. Pour clear jelly solution to fill the mould. Let is cool & set in fridge. Unmould. 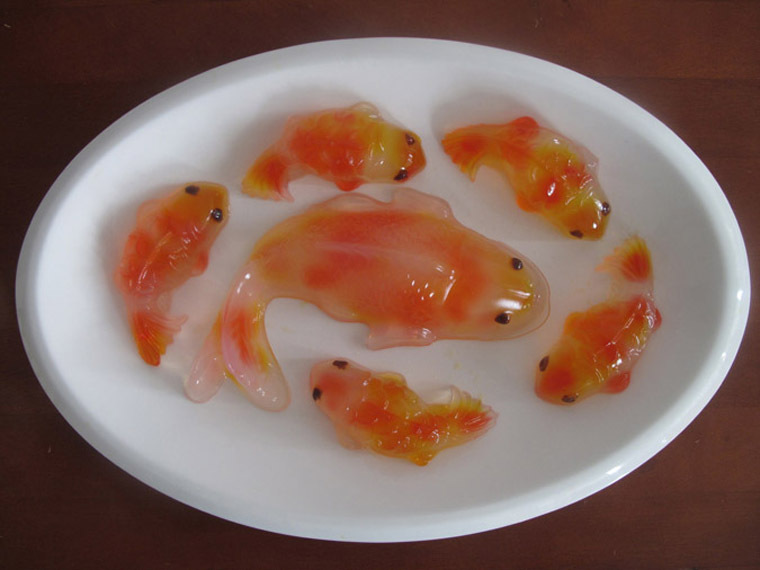 You can get koi fish jelly mould at baking supplies stores. They come in many sizes. I suggested getting different sizes for better presentation. Though its much easier to eat the smaller, bite-size ones. For an even quicker and easier version, use a bigger fish mould. Make these a few days before Chinese New Year and keep it in the fridge. Serve them on a blue plate, tray or chopping board. The fish will look like they are swimming in a pond!